Abrasive Surface: 80 - X-Coarse; 100 - Coarse; 180 - Medium; 240 - Fine. Completely water resistant and won’t swell, shred or peel apart. Made in USA. Completely water resistant and won’t swell, shred or peel apart. Smaller size. Made in USA. Completely water resistant and won’t swell, shred or peel apart. Four different abrasive surface for any types of filing you can imagine. Made in USA. Very fine grit nail file. Completely water resistant and won’t swell, shred or peel apart. Made in USA. 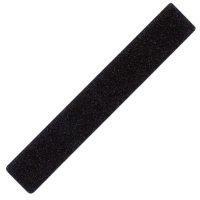 Extra-wide cushion nail file. Completely water resistant and won’t swell, shred or peel apart. Made in USA. Quality wood boards, manufactured from the finest abrasives and laminated to North Carolina hardwoods. Made in USA. Smooth, conditions and shines natural nails to an incredible, long-lasting luster. It provides exceptional nail pretreatment prior to the use of clear coats and nail polishes thereby extending treatment life. Made in USA. 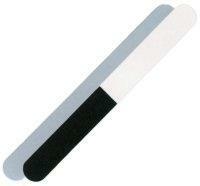 3-way buffer to smooth the uneven surface of fingernails. Made in USA. 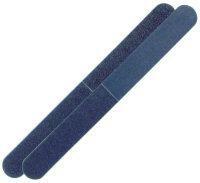 Washable, cushioned one-sided extra-fine grit nail file great for shaping artificial and natural nails. The plastic backing reinforces the file from breaking while being used. Made in USA. Size: 1 1/8"Wx4 7/8"L. 1/4" thick. Washable, two-sided, thick cushion medium and fine grit nail file to remove file demarcations in the artificial nail prior to finish buffing with the Mambo 3-Way Buffer Cushion or EzFlow Snow Monkey. The plastic center reinforces the file to keep it from breaking. Made in USA. Size: 3/4"-1 1/4"Wx7"L. 3/8" thick. 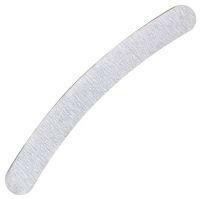 Washable, two-sided, thick cushion fine and extra-fine grit nail file to remove file demarcations in the artificial nail prior to finish buffing with the Mambo 3-Way Buffer Cushion or EzFlow Snow Monkey. The plastic center reinforces the file to keep it from breaking. Made in USA. 3-way buffer to blend, smooth, and shine the surface of fingernails. The plastic center reinforces the file to keep it from breaking. Made in USA. Designed for sidewall filing and shaping the artificial nail. Quality of paper lasts longer than competitor's files. Reinforced center prevents the file from breaking. Great for all nail shapes. Sanitizable and washable. 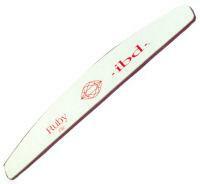 Designed for over-the-top filing and cuticle/contour filing, as well as for blending the tips. Quality of paper lasts longer than competitor's files. Reinforced center prevents the file from breaking. Great for all nail shapes. Sanitizable and washable. Designed to smooth finish artificial nails. Quality of paper lasts longer than competitor's files. Reinforced center prevents the file from breaking. Great for all nail shapes. Sanitizable and washable. 3-Way shiner that buffs the acrylic nails to a high shine. Thick foam and reinforced center prevents the file from breaking. 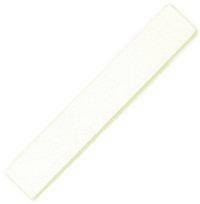 White padded nail file and resin coated for durability. Used for lightly file and smooth acrylics, gels, wraps, and natural nails. Perfect for sidewall filing and shaping artificial nails. Long lasting and designed for comfort. The plastic center reinforces the file to keep it from breaking. Sanitizable and washable. Size: 5/8"-1 1/8"Wx7"L. 1/8" thick. Adds smooth finish to artificial nails. Long lasting and designed for comfort. The plastic center reinforces the file to keep it from breaking. Sanitizable and washable. Creates a high shine on acrylic or gel nails. Long lasting and designed for comfort. The plastic center reinforces the file to keep it from breaking. Sanitizable and washable. Size: 5/8"-1 1/8"Wx7"L. 1/2" thick. The first deluxe nail files that last forever! Strong tempered glass four times harder than normal glass. Help to prevent chipping, cracking and splitting nails. Good for natural and artificial nails regardless of their material. Easy to clean and sanitize. Rinse in warm water and it is as good as new. Never wear out! Handy carrying case included with each nail file. Hold file at a slight angle to nail and file in one direction only, from the sides of the nail towards the center. Double-sided. Same quality as the regular crystal nail file but small enough to slip into a purse or wallet. The first deluxe nail files that last forever! Strong tempered glass four times harder than normal glass. 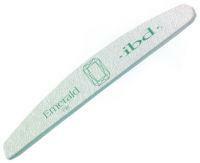 Help to prevent chipping, cracking and splitting nails. Good for natural and artificial nails regardless of their material. Easy to clean and sanitize. Rinse in warm water and it is as good as new. Never wear out! Handy carrying case included with each nail file. 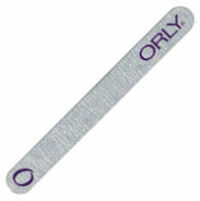 Hold file at a slight angle to nail and file in one direction only, from the sides of the nail towards the center. Double-sided. 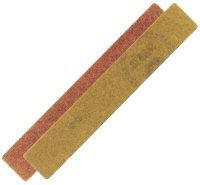 A 180 grit board for fast filing and shaping of natural or artificial nails. 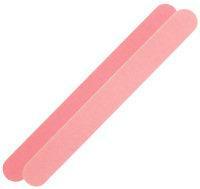 A 120 grit for natural nails quickly and easily files nails to the desired shape. A 100 coarse grit to quickly and easily file nails to the desired shape. 200 medium-fine grit gives edges a flawless finish. 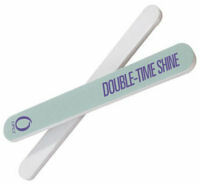 Double-Time Shine gentle buffing duo shines artificial and natural nails to a sleek glossy finish. 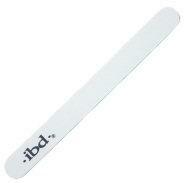 Side one smoothes nails and eliminates imperfections. Side two burnishes nails to a brilliant luster without buffing créme or oil. Perfect for between-manicure touch ups, and a great accessory for your purse, brief case or travel bag. High quality, polished sandstone. 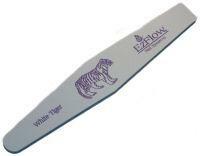 Designed with pointed edges for precision work to push and erase cuticles without scratching nails. Hold like a pencil and use to push back cuticles. Dip the tip of the stone into warm water, rub stone back and forth on the surface of the cuticle until it is removed. 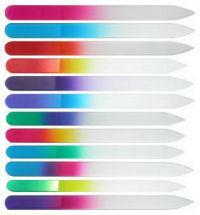 Made from layer of genuine leather, bring any natural or artificial nail to a high gloss shine. You may use with Buffing Cream or Buffing Oil (not included) for better result. 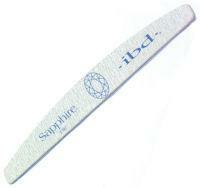 A highly cost effective professional nail file system with ergonomically designed handle, double-sided, and disposable abrasive stickers. File handle is disinfectable and reusable. Stickers can be replaced for each client. 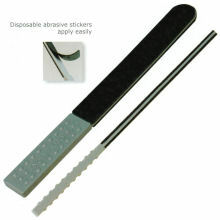 Master pack contains 1 nail file handle and 100 abrasive stickers. Use Buffing Cream on natural nails for a rapid, brilliant shine. Completely remove nail polish. Remove excess cuticle by applying a small amount of cuticle remover around cuticle and removing cuticle with orangewood stick or pusher. Apply cream to entire nail surface. Buff with soft cloth or chamois buffer to desired luster. Use soap and water to wash off excess cream. Designed to create the most brilliant shine in 2 easy steps for natural and artificial nails. Great for manicures or pedicures as well as on any artificial surface like acrylics, gels, polish, fiberglass and silk wraps. Smooth and shine natural and artificial nails. Long-lasting and washable. Long lasting, water resistant and won’t fall apart even after use or immerse for sanitize.